Excessive discordant ST elevation is a subtle but important sign of infarction in the presence of a wide QRS complex. It was first defined as ST elevation of 5 mm or more, but this rule has been modified to suggest that it is abnormal if the ST elevation is more than 25% of the height of the S wave. Alternatively, a cutoff of 20% is less specific but slightly more sensitive. 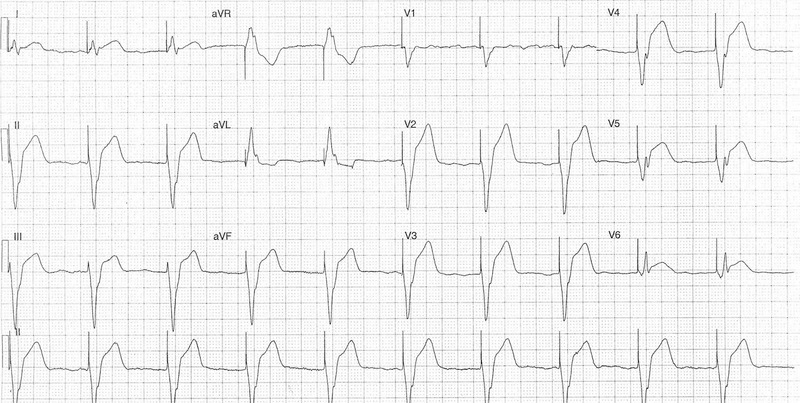 Posterolateral OMI resulting in VT, then R-on-T phenomenon and VF – repeat after sudden worsening of shortness of breath. This ECG is from a man in his 50s who presented with 1 hour of chest pain and shortness of breath. This was his second ECG after he suddenly became more short of breath. This ECG is from a man in his 60s who presented with chest pain for several hours on a background of prior coronary artery disease and hypertension. This ECG shows LBBB with excessively discordant ST elevation in inferior leads with reciprocal changes in I and aVL. The cause was a RCA in-stent restenosis. Left Bundle Branch Block, Severe Chest pain, Previous Normal Angio. What is going on? Repeat ECG 24 min later. This ECG is from a middle aged woman who presented with sudden severe substernal chest pain on a background of idiopathic cardiomyopathy and biventricular failure. This ECG shows LBBB (not paced rhythm) with excessive discordant ST elevation in III and aVF with reciprocal change in aVL. The cause was an acute lateral MI, likely due to embolism from a left atrial appendage thrombus. This ECG is from a female in her 60s presented with 2-3 days of fatigue and shortness of breath. She called EMS when her symptoms acutely worsened while she was shopping. EMS arrived and recorded a heart rate of 27. On arrival to the ED she was noted to be in complete heart block. She was given atropine with transient increase in HR to 80s. This ECG was recorded later that night after a transvenous pacemaker was placed. This ECG shows ventricular paced rhythm with excessive discordant ST elevation in II, III and aVF. There is reciprocal depression in aVL and I. The cause was an occluded proximal right coronary artery. This diagnosis was delayed and the patient died.